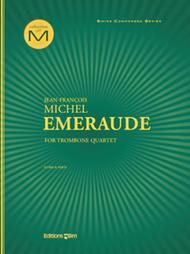 Emeraude composed by Jean-Francois Michel. For trombone quartet (3 tenor trombones, bass trombone). Contemporary. Difficulty: intermediate/advanced. Score and parts. Composed 2013. Duration 5 minutes. Published by Editions BIM (ET.TB85).In 2008, trombone virtuoso Branimir Slokar asked Jean-Francois Michel to write a piece to open the concerts of his trombone quartet. Five years later, for the 40th anniversary of his well known ensemble (1973-2013), Slokar renewed his request, but this time asked for a piece for the conclusion of concerts. The present composition, Emeraude, takes its title from the French word for emerald, the precious green diaphanous stone, the symbol for both the 40th anniversary celebrations of the quartet and the long friendship and mutual admiration shared by these two artists. The first part includes a succession of heroic motifs, introducing each performer one by one in succession as they proceed from backstage to onstage. Once they have all arrived in their normal stage positions, what follows is a spectacular Allegro vivo with subtle dissonances which enhance the virtuosity and precise ensemble playing of the 4 trombonists. It ends with a bacchanal apotheosis, which serves as a final "adieu" to the audience.